You know, when you think about it … it’s a shame that the majority of our time spent in our bedrooms is with our eyes closed. Still, it’s nice to have a pretty and peaceful place to fall asleep at night. Bedroom decor should be welcoming and comfortable, so you can wake the next morning feeling refreshed. 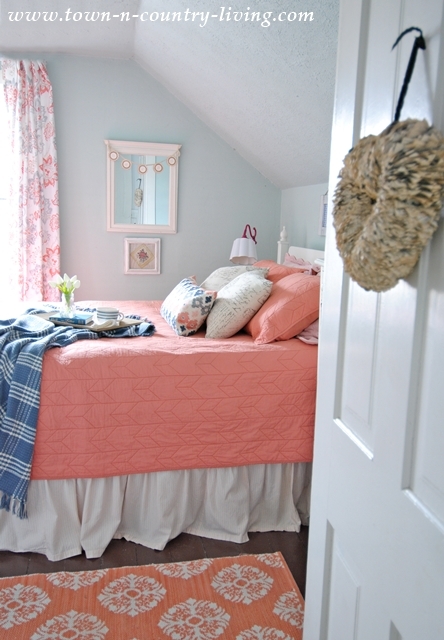 Today I’ve got a collection of 15 cozy rooms to give you plenty of bedroom decorating ideas. 1. Add a Bit of Glam. Up first is a stunning and glamorous bedroom by Designing Vibes. A tufted headboard, a floral-shaped mirror, and a mirrored nightstand all add just the right touch of glam to a serene, neutral bedroom. 2. Create Visual Interest. 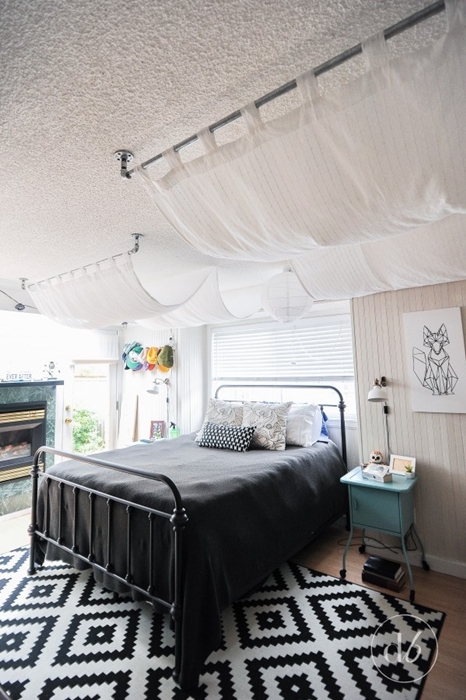 Add a unique twist to your bedroom with a draped canopy overhead, and a geographic rug underfoot. This eclectic bedroom by Dwell Beautiful is super dreamy! 3. Use Blue and White. A vaulted ceiling is always a nice touch in a master bedroom. 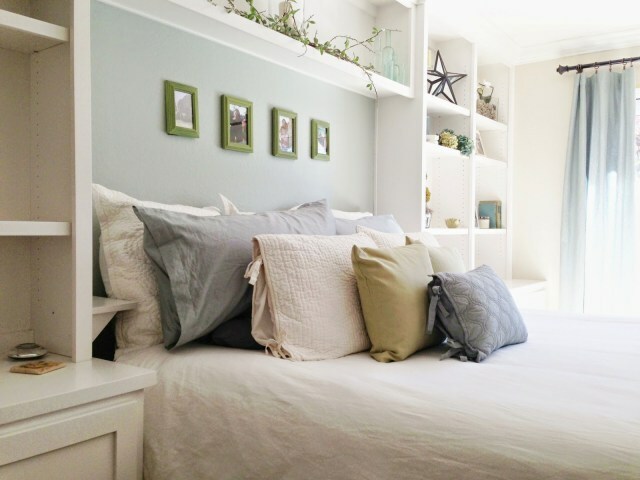 This one from It All Started with Paint is tastefully done with serene hues of blue, which always looks crisp and fresh when paired with white. 4. Take Advantage of Architectural Elements. A bay type window area is another great architectural feature to have in a bedroom. Consider yourself lucky if you enjoy a room with a view out 3 windows like this one from Christina’s Adventures. 5. Create a Statement Wall. 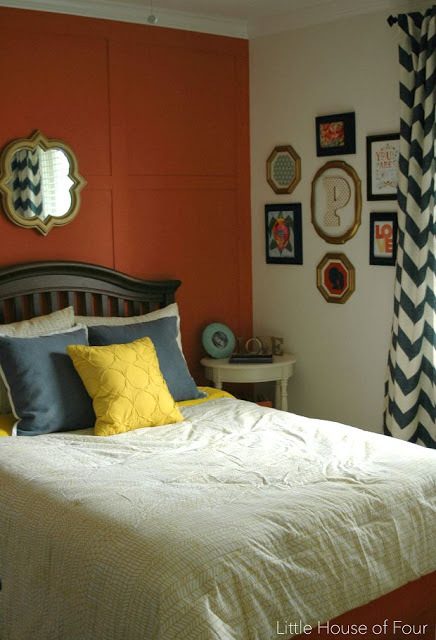 An easy way to punch up a room is to paint one wall in a strong color. 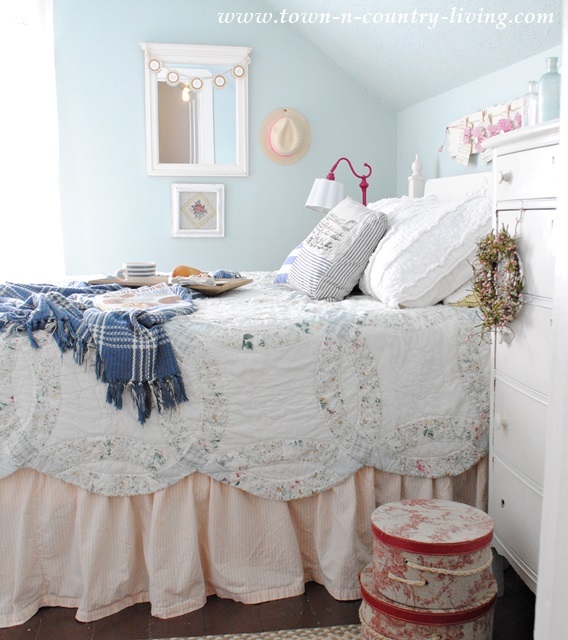 I love this sophisticated girl’s bedroom by Little House of Four. 6. Add Cozy Comfort with Soft Bedding. Don’t skimp on sheets and pillows. To enjoy a good night’s slip, you deserve soft sheets and plump pillows like this farmhouse style bedroom by Ella Claire. 7. Keep It Simple and Serene. 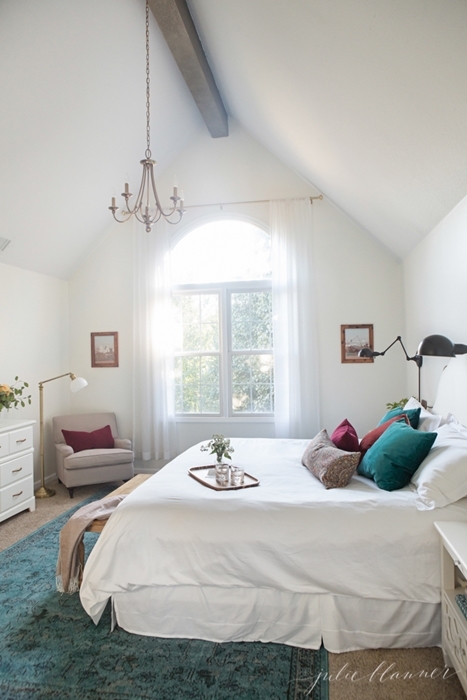 Often it becomes tempting to really play up a high ceiling, but his beautiful white bedroom by Julie Blanner proves that less is more. A single wooden beam and simple chandelier draw attention to the vaulted ceiling while a soft blue rug grounds the room and adds color. 8. Create a themed bedroom. 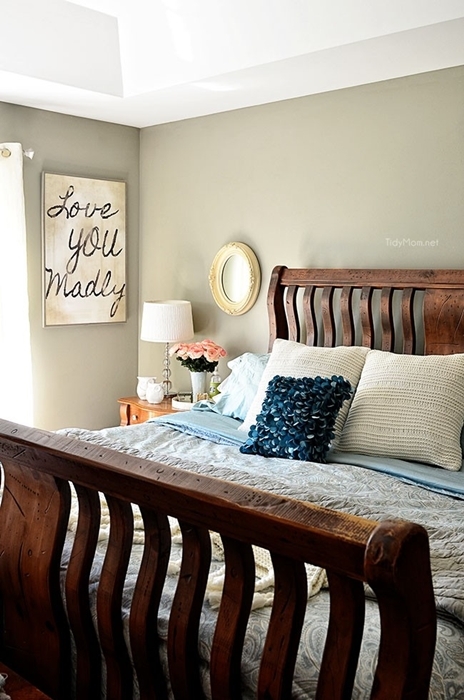 This beautiful guest bedroom by House of Hargrove stays true to its farmhouse style. Neutral bedding, a painted dresser, and planked wall emphasis farmhouse appeal. I’ll let you in on a little secret. 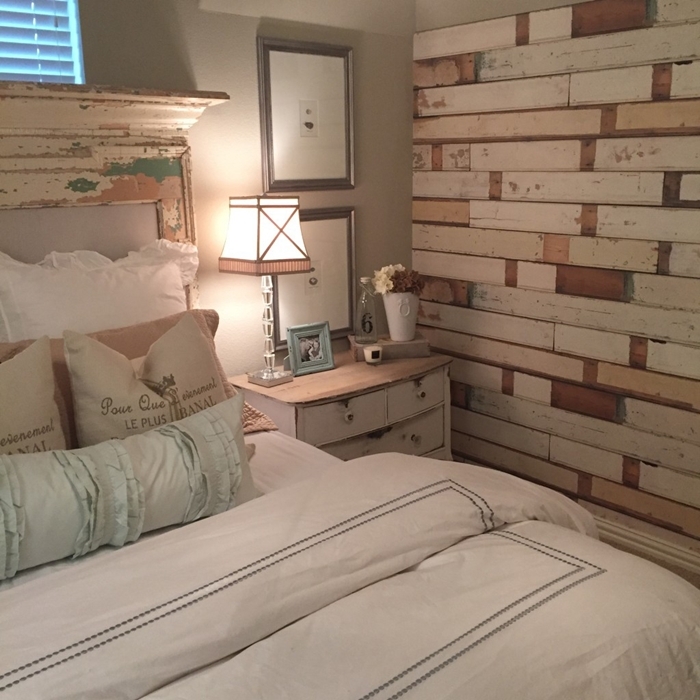 That planked wall is actually wallpaper! 9. Decorate like a Bed and Breakfast Inn. 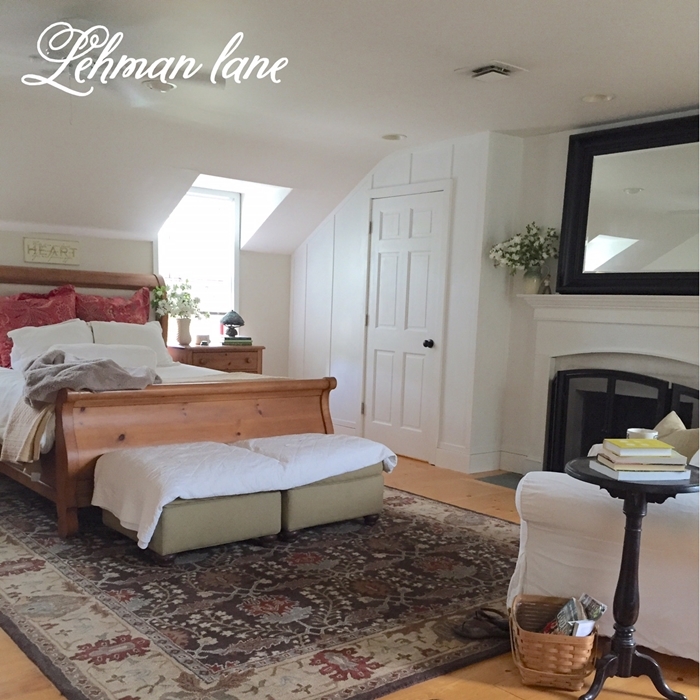 A stunning sleigh bed, a rich oriental rug, and a warming fireplace all come together to create a bedroom space at Lehman Lane that feels like you’re enjoying a cozy weekend at a bed and breakfast. 10. Don’t Be Afraid to Add Color. Most people like to keep their bedrooms white or neutral-toned. 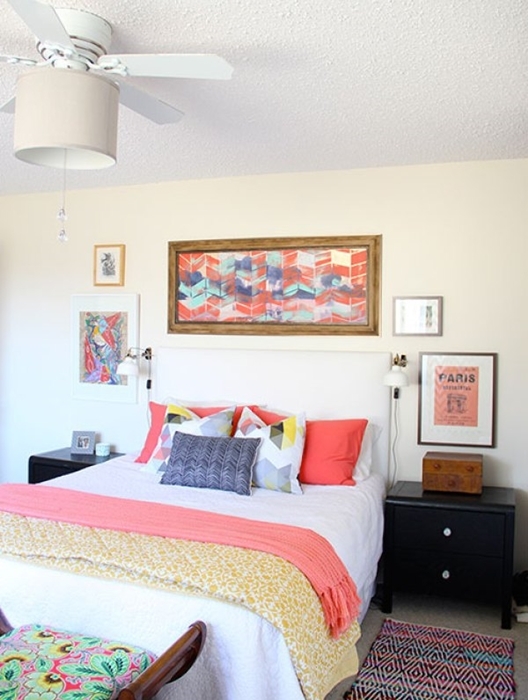 When you have white or beige walls, be courageous and add pops of color with fun pillows and throws like this cheery bedroom from Fresh Crush. 11. When in Doubt, Go the Beach Route! Coastal style is one of the best bedroom decorating ideas out there. Cool blues, foamy white, and sea green are great color choices, paired with taupe or light brown that mimics the color of sand. You’ll wind up with a serene bedroom like this one from Happy Happy Nester. 12. Incorporate a Statement Bed. 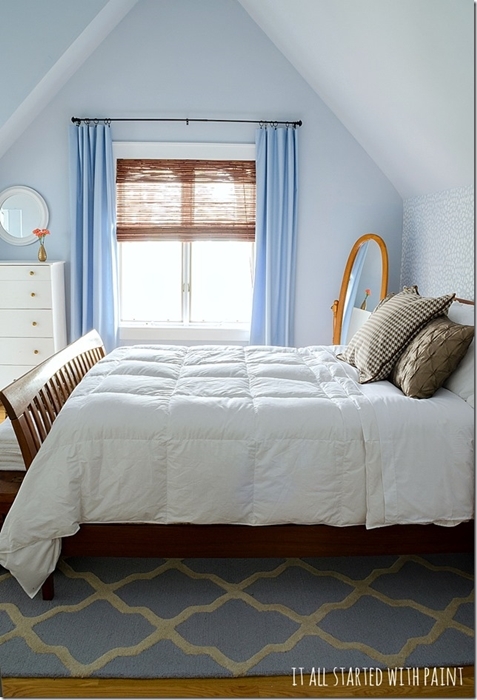 Tidy Mom ensures her gorgeous bed is the focal point in her pretty bedroom. This is a great design strategy for small spaces. Use one key piece of furniture to take center stage. 13. Consider Lighting Options. This stunning bedroom by Table and Hearth showcases great lighting options. Matching sconces provide light for night-time reading while a stylish ceiling fan creates a soft glow while cooling the room at the same time. The slightly white-washed floors are a beautiful touch, too. 14. Keep a Simple Color Scheme. 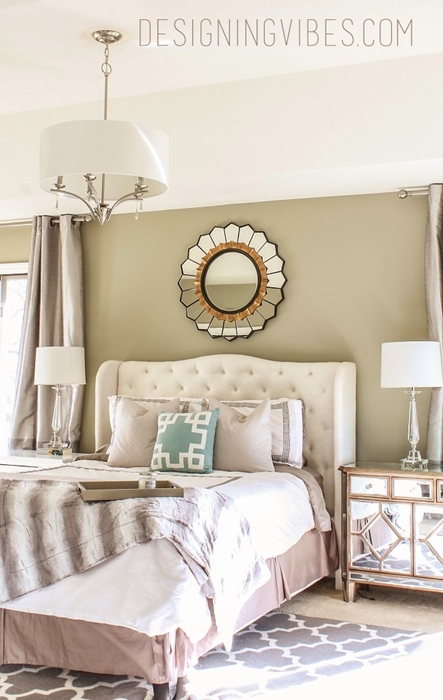 Neutrals always create a soothing, peaceful space and are a perfect choice for a relaxing and comforting bedroom. Table and Hearth pairs her neutrals with soft, cottage white furniture. 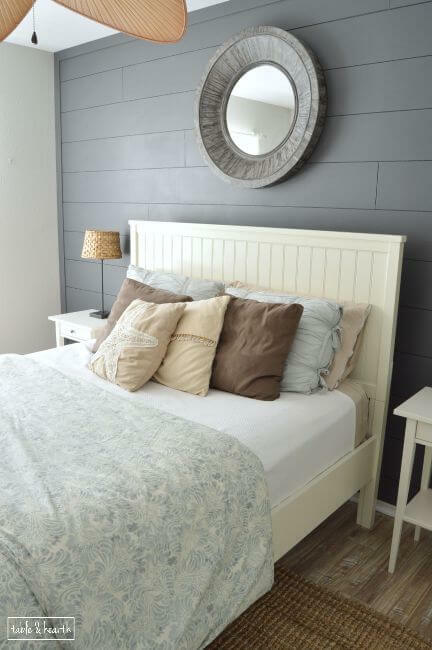 A gray shiplap wall adds just the right touch of drama. 15. Redecorate by Changing Your Bedding. Perhaps the easiest and most economic of bedroom decorating ideas is to swap out the bedding. Here in my bedroom, I’ve used a new coral comforter to change the look of my farmhouse bedroom. 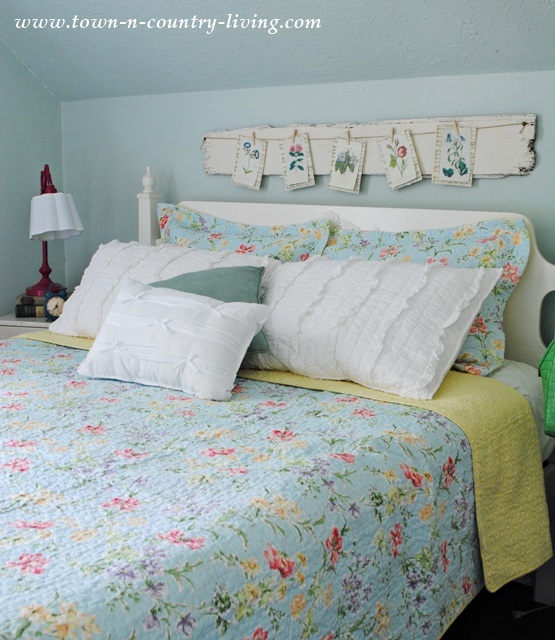 Last spring, I used a floral Laura Ashley coverlet to quickly change the look of my bedroom. And at times I like to soften the look of my under-the-eaves bedroom by using my wedding ring quilt. I hope you’ve found some helpful bedroom decorating ideas to freshen the look of your own bedrooms. There’s so many great ideas available and I thank my fellow bloggers for letting me share their gorgeous rooms! Great ideas, Jennifer! White is my favorite color and it looks stunning on these bedrooms. Really opens them up and sunlight looks natural in it. hey girl love all the bedrooms! So pretty! I would love to have a sleigh bed! These are all great bedroom decor ideas. They are simple and yet each is special! Your bedroom is so pretty every way you decorate it. You have that touch! This was very nice, I especially like your new comforter. It adds a nice spot of color. I am so honored to be included in this group of stunning bedrooms! Thank you so much! Your post is awesome! 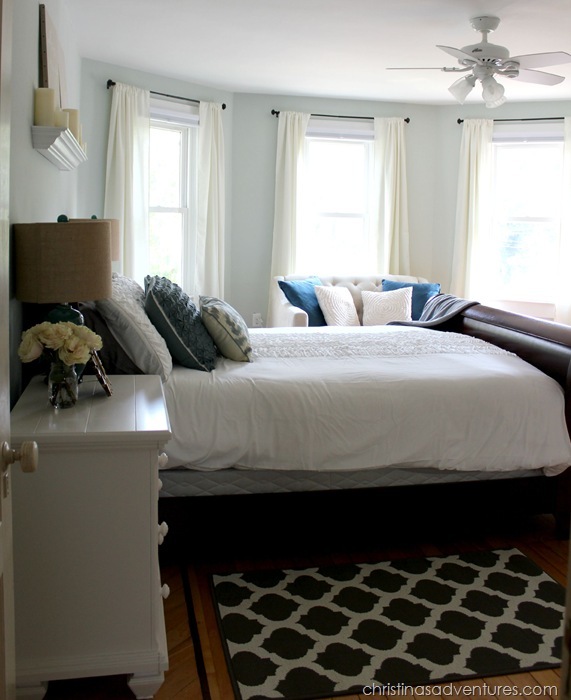 Loved all the bedrooms you posted and thanks so much for including my beachy master bedroom! You are so sweet to include me, I feel so honored.